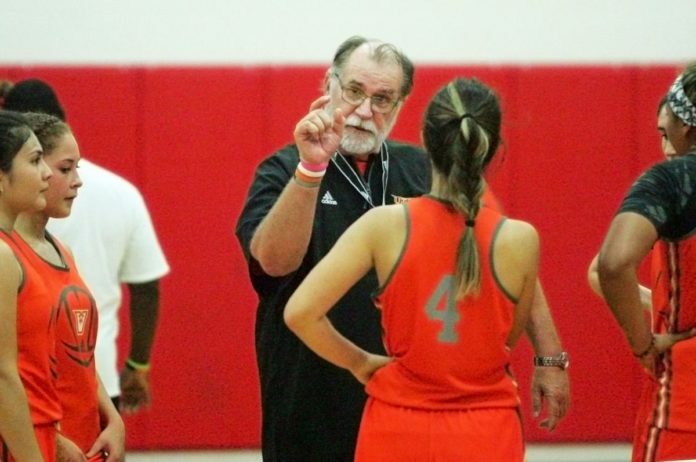 University of Texas Rio Grande Valley head women's basketball coach Larry Tidwell gives instruction to the team during practice at Sharyland Pioneer High School. EDINBURG — During the 15-minute drive from their home in Edinburg to last Saturday’s UTRGV women’s basketball game against Chicago State, redshirt junior guard Daniela Azubell gave instructions to her sister Emily, a redshirt senior guard. With UTRGV leading by more than 30 points, the seldom-used Azubell sisters checked into the game with about three minutes to play, marking the first time they’d been on the court simultaneously at the Division I level. After Emily found Daniela for a 3-pointer with 1:09 remaining, Daniela came up with a steal on the ensuing possession and started leading UTRGV on a fast break. Emily cut through the lane and Daniela fed her the pass for an easy layup, marking Emily’s first points of the season. Though Emily is a year older than Daniela, the two have played together for most of their careers. They shared the court at Edinburg Vela in 2012-13 before enrolling at Allen Community College in 2014-15, Coastal Bend College in 2015-16 and finally UTRGV last season. With Daniela taking a redshirt last year, the game against Chicago State marked the first time they linked up at UTRGV. UTRGV returns to action with a game against New Mexico State at 7 tonight in the UTRGV Fieldhouse. The Azubell sisters have been coming to UTRGV women’s basketball games since they were in middle school. Daniela said the trips gave her a fresh perspective on the Valley’s high school basketball scene. “Some people can be delusional and be like, ‘I’m the best in the world,’” Daniela said. That point became even more clear when Daniela accepted an offer to play at Allen Community College in Iola, Kansas — about 900 miles from Edinburg. The coach at Allen was willing to give Emily a roster spot, as well. After spending the following year at Coastal Bend College, the Azubells asked UTRGV coach Larry Tidwell for the opportunity to walk on to the team. Emily had already been with the program for a redshirt year in 2013-14, so Tidwell was familiar with the two local products. Daniela redshirted last season, while Emily played three minutes between two games. While last Saturday marked Emily’s first action of the season, Daniela has taken on a more prominent role, appearing in 10 games and connecting on 9 of 24 3-point attempts. She’s taken only one shot that wasn’t a 3 this season — a far cry from the player who said she couldn’t shoot while manning the frontcourt at Vela. As a result, Daniela has become a secret weapon for the Vaqueros. She subbed into UTRGV’s game against UMKC on Jan. 6 as the Vaqueros were set up for an out-of-bounds play trailing by two points in the final seconds, but she did not touch the ball. Against Grand Canyon on Jan. 13, Azubell subbed in with UTRGV down 12 points during the final three minutes to try to spark a rally. She made a 3 and picked up an assist before subbing out. Daniela said she and Emily still play one-on-one in the family driveway, with plenty of trash talk between the two. Both say they’ve tried to learn from the other, with Emily especially working to adopt Daniela’s aggressive nature. Through anything that happens, the Azubell sisters can always fall back on the comforts of home.